Relaxation massage is more towards soothing the muscles and relaxing the mind. Yet, I believe that my relaxation massage is still therapeutic. Reflexology is a great modality for those that want to relax, but are a little nervous about massage. How do I know if I need a therapeutic massage? When someone comes in with a specific ailment, such as, an injury, acute or chronic pain, this is when I provide sort of a medical therapeutic massage. I’ll concentrate on those areas and work on reducing or releasing the pain, gaining better range of motion, myoskeleton intregation and/or breaking down scar tissue so that the client may move and feel better in their everyday activities. How often should I get therapeutic massage? This just depends on the severity of the injury, with auto accident injuries I follow a basic protocol, for example: the first few weeks up to three times a week, and then I’ll bump it down to two times a week, then once a week, then bi weekly and so on. Chronic and Acute pain depends on how much pain you are in and how important is for you to be out of pain on a regular basis. After we reduce the pain to a manageable level or get relief, I would suggest setting up a maintenance program to keep the soreness or pain at bay. Once we switch you to a maintenence program we’ll move to a general therapeutic massage to support good health throughout your whole body. What techniques or modalities do you use to care for these ailments? You know this question is probably the hardest question for me to answer, because some people are looking for a certain modality. Over the years I have integrated several techniques and modalities into my style, at times I really can’t say when one ends and one begins. My main style does lean more towards a firmer pressure, the way I view it is I can always go lighter. I look, listen and assess the client’s body and use the variety of techniques that I believe is going to get the best results. I may use Neuro-Muscular, Myoskeletal, sports massage and stretching, trigger point, energy therapy, release point, reflexology, nlp, eft, techniques I’ve picked up from other therapist, etc. To me the importance isn’t in a certain modality, what is important is putting together an effective massage to enhance the healing process of the client’s body. You talk about range of motion, do you use stretching in the massage? Yes, I do use stretch techniques during the massage. By using stretching to improve or regain your full range of motion is “key” when it comes to pain relief. When the muscle cannot relax or contract fully to provide a certain body part a full range of motion (ROM) this will cause muscular and structural imbalance. By using passive and active stretching during the massage we are able to start to correct these imbalances. Providing the mix of stretching and massage is an incredible healing tool. Even though, I just said stretching and massage is an incredible healing tool and it is, yet massage isn’t going to do everything for you, even though I have seen it happen. In addition, you have to be actively responsible for your own well-being, I will most likely give you stretches, other movement therapy and/or energy therapy that you will need to do at home on a regular basis to help obtain the balance you want in your body. What happens when you have muscular and structural imbalances? As I just stated you start to lose ROM, your body is design to keep your eyes on a horizontal plain, with that in mind the rest of your body will shift, twist and turn in whatever direction it needs to keep your view level, even if it means creating pain in the body :-(. The job of a therapeutic massage therapist and other structural specialist (chiropractors, osteopaths, physical therapist, and sometimes surgeons) is to figure out the best way(s) possible to bring the skeletal system back to a postural foundation so that the muscles can move freely throughout their full ROM. In other words, if a muscle has to do the job that a bone (your postural foundation) should be doing it becomes tight and inflexible, creating less movement, tightness around the nerves and joints, the nerves fire wanting the muscle to release, but if the muscle releases it will create imbalance in the body and the eyes won’t be horizontal, the nerves fire more creating pain, the body shifts more to avoid the pain and in return creates more tightness in other areas of the body. This cycle may continue until you can start to obtain a proper structural balance through massage therapy or another structural modalities. The way I view it is when someone comes in for a massage and is just stressed out, has a few aches and pains, or has no aches and pains and just wants some time to unwind. So is a relaxation massage a Swedish Massage? Swedish massage is known as a relaxation modality, even though I do use some Swedish techniques in the massage, I will also use some therapeutic massage techniques for those with aches and pains to provide the relaxation that the client describes to me, but for the most part I wouldn’t say that the massage I provide is a Swedish Massage. Do you provide deep tissue massage? Yes, but I have found over the years the term “deep tissue” is pretty vague for most people. I have had some people who have come in wanting a deep tissue massage and when I get started I find out they just want a nice firm massage, and that’s ok. Because all in all, 90% of all of people I’ve massage want the maximum pressure that their body can handle within their comfort zone, they want that “feels so good” or “hurts so good” feeling. My style is to focus on getting to that point; I believe that the maximum healing is within that zone. Everyone is different and with my knowledge and sense of proper pressure that the body will respond best to plus the feedback of the client, we can create the ideal massage for you. Is there anyway for me to know if the massage pressure is too hard? Yes, since we want to take the pressure to the hurt so good state, there may be muscles that are sorer than others. In most cases these muscles are very tight or injured. Here is what I tell my clients about finding the right pressure when it hurts. If you feel like you need to tighten up other muscles to protect the area I’m working on then the pressure is too much and the massage may be counterproductive. Don’t go into the massage with the attitude of no pain, no gain and you’re going to tough through it, that doesn’t always make for a productive massage and I personally don’t like to go in to a massage with that direction of thinking process. Creating a good a communication relationship between you and I is important so that I know what is going on within your body. I can feel the sore and tight areas most of the time, I can usually gauge the right pressure and feel if other muscles are engaging, but there are also times when the body tricks me, since I cannot feel the pain you need to let me know the sensations you are feeling. So then what do you mean by a “feels so good” or “hurts so good” feeling? Feels so good or hurts so good is kind of hard to explain, since it is an experience. Have you ever had a sore upper back and then leaned back on a chair to stretch it out and applied pressure, as you apply that pressure on certain areas that hurt more than other areas and even though it hurts or is a little painful it feels good because you can feel it releasing. Well that is sort of the same sensation you’ll get with massage except you get to stay relaxed and someone else is releasing those muscles for you. 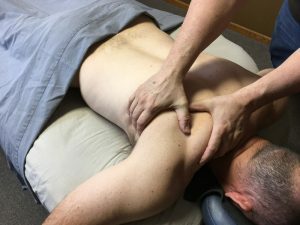 I believe the massage isn’t just about rubbing muscles, ligaments and tendons, knowing techniques, modalities and protocols. It’s also about obtaining an energetic connection with the client. I have heard from many of my clients say that the massage seems to get better or be different every time, even though it feels a lot like the same moves during each massage. Well I focus my intention towards what is going on in my client’s life and what they want to gain from the massage. For example: If a client comes in and says that their life feels out of balance and they would like to gain that balance back some how, my energetic intention is to focus on what that client has described to me as being balanced. Another day that same client may come in and tell me that they feel overly stressed out and describe how they would like to feel instead. Even though the massage may be close to the same moves for both of these massages, the energetic intention changes making the effectiveness of the massage greater. There has also been times when I have started working on a client in the direction their mind believes that they want the massage to be like, but as I start to work the body and when the body doesn’t respond, that’s when I have to stop listen to the body and proceed in that direction the body has energetically relayed to me. When applying pressure to these reflex areas it can promote health in the corresponding organs and other body parts through energetic pathways. Reflexology shouldn’t be painful. If you feel discomfort, be sure to let me know. My goal is to find the pressure that will be the most productive for the treatment while staying within your comfort zone. Some areas may be tender or sore, and I may spend extra time on these points. The soreness should decrease with pressure. If you’re ticklish, not to worry. I’ll use techniques to reduce or eliminate that sensation. Reflexology is also used for post-operative or palliative care. A study in the American Cancer Society journal found that one-third of cancer patients used Reflexology as a complementary therapy. Please consult your doctor before any treatments if you have cancer, I will not provide Reflexology without a doctor’s note. A typical treatment is 60 minutes long and begins with a consultation about how you are feeling and what you would like to achieve from the session(s). I will send approximately 25 to 30 minutes on each foot. You are then asked to remove your shoes and socks and lay comfortably on a massage table, other than that you remain fully clothed. I will assess your feet, than do some relaxation techniques on your feet and ankles to start. This helps you unwind and prepares the feet for the rest of the treatment, I will be stimulating various points to identify areas of tenderness or tension. Feedback is always welcomed. You are also welcome to talk through the session or snoring is allowed. Most people feel calm and relaxed after a treatment. You may even feel sleepy. I highly recommend drinking lots of water after each session. If you’re pregnant, talk with your doctor first and please inform me. If you are a new client please arrive a little early to fill out a health history form. If you have foot ulcers, injury, or blood vessel disease such as blood clots, I recommend postponing the Reflexology treatment until you heal or with your doctors permission. I have never had a massage before, what do I do? I would suggest eating something within 4 hours of your massage and take a shower. Arrive a little early to fill out a general information form. 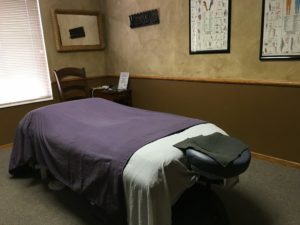 I will than take you into the massage room and we will go over some of the general questions from the form, answer any of your questions and find out more about what you want to gain from the massage. I will explain how to lay on the table and how you will be draped (covered up) throughout the massage. I will ask you to disrobe, some people take off everything and others take off nothing, it makes no difference to me, whatever is the most comfortable for you. I look at it as, if you are not at ease the massage is going to be less effective. I will mention that the less you have on the smoother the massage is and that some people feel better just leaving their underwear on. (Note: If you choose to stay fully clothed please wear cottons, such as, a T-shirt and sweats or gym shorts. For women I would suggest removing your bra from under your T-shirt). I will leave the room for you to disrobe or change clothes if needed and get on the table. The massage room is dim and has relaxing music playing in the background. During the winter months the table is heated, and hot towels and stones may be used. I will knock on the door to see if you are ready, if so let me know and I’ll enter. As I start the massage I will ask for some feedback to establish a comfortable amount of pressure. I will usually start with a medium pressure, if this is comfortable to you I will stay the same, if not, I will go lighter or firmer. If you choose one pressure at the start and later you want the pressure to be changed, you are welcomed to let me know. Now is your time to relax and enjoy. Some people talk throughout the entire massage, others ask questions every now and then, other may lie silently enjoying every minute of it and other drift off into a deep relaxation. (Note: snoring is allowed in the massage room.) Since this is your first massage it is normal to feel nervous. Not knowing what the massage is suppose to feel like, what’s going to happen next is always a little uncomfortable at first and this is normal. You are always welcome to ask questions and it is my intention to make it as relaxing and comfortable as possible. At the end of the massage I will let you know that we have finished. I will leave the room and you can take your time getting off the table and get dressed. You will then exit the room and I’ll meet you in the lobby area. You’ll receive a bottle of water, pay for the session and reschedule. (Note: Make sure you drink plenty of water after a massage. Toxins get built up in your body from exercise and everyday movement, when massage is applied it may move those toxins, water will help flush those toxins from your body.You may also feel sore for a couple of days after the massage, this sensation is so random even with myself after having massage for years there are times after a massage I’m sore for a couple of days). In my practice the session is the given time stated, example 60 minutes is a 60 minute session that includes disrobing and getting on the table. As far how long is the right length of time for you? If you just want your neck, shoulders and back massaged then a 30 minute massage will work, if you want a full body and you’re under six feet tall an hour massage is good, if you want a full body and want a deep tissue massage or you are over six tall and muscular a 90 minute massage would be the best. The most common length is 60 minutes. How often should I reschedule for a massage? Over the years what I have noticed, in general, is people start to feel the stress and soreness creeping back into their body at about three weeks. Here’s my suggestion, if you would rather not have that built up feeling of stress and soreness reschedule before the three weeks. If you would like to ride it out longer than that I would say no longer then six weeks. Yet, for optimum health and wellness once a week is best. I’m pregnant, is it alright to get a massage? Yes, but I personally like to wait until you are through your first trimester before providing massage. Why do you wait until after the first trimester? Your body is going through a lot of changes within this time period and the baby is in it’s first development stages. It is my preference to wait because massage of the fact and one of the benefits that massage pushes toxins out of the muscles, this is why some people may get sick after a massage. To me since your body is already going through so many changes as it is, I would rather not add extra stress to it or your baby. So I wait until after my first trimester, how do you do the massage? I use a body support cushion for pregnany massages, this cushion allows you to lay face down, the cushion is cut out for your belly so no pressure is being placed on the baby. You said that sometimes people may get sick, is there certain times when I shouldn’t get a massage? Yes, when you are sick I suggest not getting a massage at that time. I know that is the time when a massage sound like it would feel the best, but the body is in overload mode, it is fighting off the ailment. Like I said before massage pushes out toxins these toxins are going to overload the body even more, it’s a 50 – 50% chance your going to get worse or get better. Even if you feel like it’s worth the risk, I would rather you stay home a few more days and not spread it around, or find a lymphic drainage massage therapist in town and find out if they can help. I should mention that if you have just had a surgery within the last six week, I do not recommend massage and I will not provide a massage until after the six week period. It doesn’t matter if it was a major or minor surgery, the body is going through it’s natural healing process and it needs to heal. By doing massage it may increase the chances of disrupting the body’s natural healing process and increasing the chance of a delaying that healing time.